Fertile, well drained sandy loam is ideal. Yes, but cultivars should be chosen that fit the climate. Some pecans are much more cold tolerant than others. 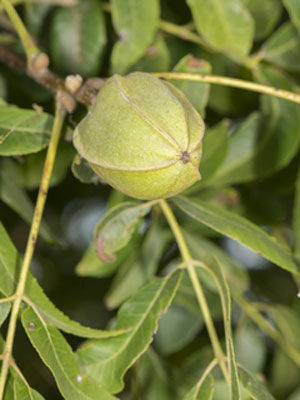 Pecans are large, spreading trees that make good shade trees in large landscapes. Pecans are outstanding nut-producing landscape trees in much of the Southeast USA. Pecan trees will bear for decades. It takes 20 years for a pecan tree to grow to maturity. Gather nuts as they fall to the ground. Allow them to dry in a place that is protected from rain. Pecans grow best in warm, humid climates. In cool climate pecans may not produce nuts, and may suffer from coral spot.